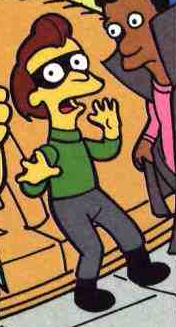 The Amazing Lenny is the superhero alias of Lenny when he , with the rest of Springfield, is turned into a ten year old by Dr. Colossus. Like the rest of the group she has no real super powers. When Dr. Colossus activated his Anti-chronometric responsolite consolidator (aka the Ten-inator), turning he and everyone else in town into ten year olds. Soon Bartman leads a whole new team to Colossus' lair, consisting of Houseboy, Mature Lass, Commander Cool, Mini-Mom, The Silencer, The Laughter, The Amazing Lenny and Kid Blackula. The Amazing Lenny's role is small, though he helps push down the gates and laughs at Colossus with the rest of the group, causing him to de-activate the ray and send everyone back to normal. Modified on December 10, 2015, at 13:55.